The Moon is Mine - ALL Mine, I tell You! By Keith Cowing on August 29, 2008 5:31 PM. Editor's note: Sorry Al and Doug: I claimed all of the lunar surface 5 minutes before you guys did - whenever that was. How? Because I say so. By Keith Cowing on August 29, 2008 10:40 AM. 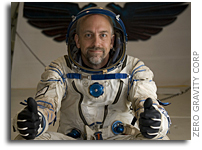 Editor's note: Today on the Space Show: Richard Garriott will appear live from Russia on this live streaming Internet radio show. Listen LIVE 9:30-11:30 AM PDT. By Keith Cowing on August 25, 2008 2:36 PM. Editor's note: Check out the rocketshadow Twitter feed from XCOR. Henry Vanderbilt got tapped for right seat with Rick Searfoss flying. Check in to see how that flight is going. By Keith Cowing on August 20, 2008 9:13 PM. "... Then you have to fork over $30 million to Space Adventures, a company that serves as go-between with the Russian space program. Just don't call its clients space tourists. "That term implies you are there to take photos and hang out," Garriott says. "I'm trying to prove you can actually be a valuable contributor to the activities on board the space station." He notes that he'll be conducting research on protein crystal growth on behalf of a biotech firm. But he doesn't deny that he's really going up because it will be a friggin' blast. "I'd be misleading you if I didn't admit that it's a very selfish activity," he says." By Keith Cowing on August 15, 2008 11:35 AM. Editor's 11:35 am EDT update: An email to the NASA purchasing agent and a correction was made in a matter of minutes! Now THAT is efficiency! By Keith Cowing on August 7, 2008 12:43 AM. "According to Elon Musk: We have a definitive understanding of what went wrong on Flight 3. The problem was due to a design error not a production or quality assurance issue. The thrust transient was longer than it was for the prior flight. The previous flight had an ablatively cooled engine. Flight 3 had a regeneratively cooled engine. The gap between engine cut off and staging was 1.5 seconds - which was fine for the ablatively cooled engine on Flight 2. But on Flight 3, with the regeneratively cooled engine, there was some residual thrust after engine shut down and this caused the first stage to be pushed back toward the second stage after separation and there was a recontact between the stages." Editor's note: SpaceX puts everything on line - live - and comes back with a cogent failure analysis within a matter of days - for all the world to see. Contrast this with NASA's Ares/Constellation program wherein test failures are hidden and design flaws are suppressed. I think I know who will get hardware on-orbit first. By Keith Cowing on August 6, 2008 11:39 PM. Google Lunar X PRIZE T-Shirt Design Competition! "We've got rockets. We've got rovers. We've got a race. But what we don't have is a creative, original T-Shirt that perfectly captures the spirit of exploration and innovation of the Google Lunar X PRIZE. And is any world-wide competition complete without a cool T-Shirt? No! So we're reaching out to you, our biggest fans, to help us solve this grand challenge, in true X PRIZE Foundation fashion (no pun intended)." By Keith Cowing on August 3, 2008 12:52 AM. It was obviously a big disappointment not to reach orbit on this flight. On the plus side, the flight of our first stage, with the new Merlin 1C engine that will be used in Falcon 9, was picture perfect. Unfortunately, a problem occurred with stage separation, causing the stages to be held together. This is under investigation and I will send out a note as soon as we understand exactly what happened. The most important message I'd like to send right now is that SpaceX will not skip a beat in execution going forward. We have flight four of Falcon 1 almost ready for flight and flight five right behind that. I have also given the go ahead to begin fabrication of flight six. Falcon 9 development will also continue unabated, taking into account the lessons learned with Falcon 1. We have made great progress this past week with the successful nine engine firing. As a precautionary measure to guard against the possibility of flight 3 not reaching orbit, SpaceX recently accepted a significant investment. Combined with our existing cash reserves, that ensures we will have more than sufficient funding on hand to continue launching Falcon 1 and develop Falcon 9 and Dragon. There should be absolutely zero question that SpaceX will prevail in reaching orbit and demonstrating reliable space transport. For my part, I will never give up and I mean never. Thanks for your hard work and now on to flight four. Continue reading Falcon Launch Video and Message from Elon Musk. By Keith Cowing on August 1, 2008 7:30 PM. "Space Exploration Technologies Corp. (SpaceX ) conducted the first nine engine firing of its Falcon 9 launch vehicle at its Texas Test Facility outside McGregor on July 31st. A second firing on August 1st completed a major NASA Commercial Orbital Transportation Services (COTS) milestone almost two months early. At full power, the nine engines consumed 3,200 lbs of fuel and liquid oxygen per second, and generated almost 850,000 pounds of force - four times the maximum thrust of a 747 aircraft. This marks the first firing of a Falcon 9 first stage with its full complement of nine Merlin 1C engines . Once a near term Merlin 1C fuel pump upgrade is complete, the sea level thrust will increase to 950,000 lbf, making Falcon 9 the most powerful single core vehicle in the United States." This page is an archive of entries in the Commercialization category from August 2008. Commercialization: July 2008 is the previous archive. Commercialization: September 2008 is the next archive.